Terrific October weather. A familiar golf course. Experience and confidence. It all added up to a solid start for the Boone Central Cardinals in their quest for a third consecutive state girls golf championship. Boone Central put themselves in position to ‘three-peat’ Monday by shooting a team score of 373 at Quail Run Golf Course in Columbus, which had them tied for the lead in the 2011 Class C State Tournament with Valentine. Mid-State Conference rival Wayne lurks two strokes back at 375 and G.I. Central Catholic, which defeated the Cardinals in the C-1 District last week, is six strokes off the pace. “We played really well today, I was pleased,” said Boone Central Coach Dennis Walters, following Monday’s opening round. “We’re set up in a good position. Boone Central got their shot at another state championship in district play last week. 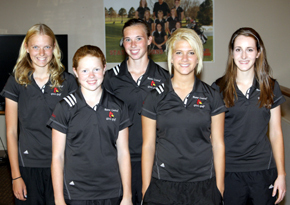 For the first time in 2011, the Boone Central girls golf team failed to win a tournament. However, with a runner-up finish in the C-1 District at Central City’s Valley View Golf Course Tuesday, Oct. 4, the Cardinals did qualify for the 2011 Class C State Tournament and a chance to win a third consecutive state championship. On a Valley View layout featuring hard, fast greens, Boone Central finished nine strokes behind Grand Island Central Catholic, a team the Cards had beaten by 26 the previous week in the Columbus Scotus Invitational. The Crusaders took the C-1 title with a 385 total, while Boone Central (394) and host Central City (396) also qualified for the state tournament field.